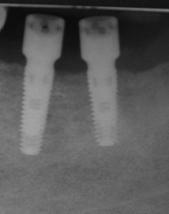 The soft-tissue interface of TRI Dental Implants is unique and innovative at the same time. It is very smooth, leaving no "pockets" despite its broad platform switching concept. This platform switch is consistent across all TRI prosthetics components and allows for a consistent and tight soft tissue seal around the implant abutment connection. This is supported by a product development concept, in which all prosthetic components integrate a consistent emergence profile - covering all components, from impression post and healing cap to the final abutment. © Copyright 2019 TRI Dental Implants. All rights reserved.